I have been meaning to apply a new design to my blog ever since I transferred it to WordPress last year. However, my knowledge of PHP is limited to what PHP actually stands for and therefore it was difficult to allocate very much time to it, let alone apply new designs. With the development of Taggloo and learning Manx, I felt it was time to develop some improved presence, and this is the result. 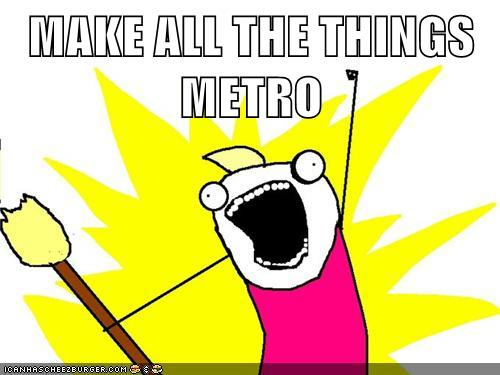 Since the revitalised Windows Media Centre user interface, and then Windows Phone 7, I have become a big fan of the Metro user experience. It is super simple, smooth and is an experience that is easily portable between the “three screens” of Windows Phone 7, Windows 8 and XBox 360. The design applied to this blog was drafted quickly on the back of a piece of paper in the office as the idea hit me. What I have ended up with is a slick and distinctive result that I feel is sincere to Metro’s philosophy of clean lines and content-first. The blog runs on the Umbraco Content Management System, and is affording me the opportunity to re-assess the CMS for other projects I may become involved in. It feels like a very mature product, if a little difficult to grasp at first and not entirely suitable for the non-technical user. However, it feels like where Sitecore is, in terms of the importance attached to XSLT. The intricacies of Umbraco notwithstanding, once I’d figured out the XSLT structure, I was away! The blog would not be possible without the help of Andreas Heinakroon, who very kindly adapted my back-of-fag-packet scratchings to an all singing, all dancing HTML template that could be applied to my blog, complete with winking tiles. Until I worked with Andreas, I thought I could come up with designs – at least mediocre ones! How wrong I was! Never underestimate the power of a good designer. I would definitely check out his blog, for a refreshing outlook. Also, thanks to Owen Cutajar, who hosted my blog on his WordPress platform while I continuously prevaricated in trying to get a new design sorted and the necessary time to devote to learning PHP and WordPress specifics.